Does your IT organization’s management solution lack support for the latest technologies? Industry analyst group EMS is in a constant dialogue with CIOs about their top challenges and concerns. Surprisingly, many are saying the solutions available to them are insufficient to their needs, particularly with regard to mobile and application performance monitoring. 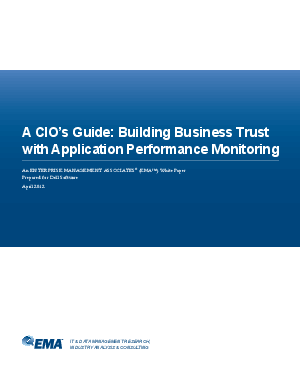 A CIO’s Guide: Building Business Trust with Application Performance Monitoring, a white paper prepared by EMA, highlights the benefits of an APM solution in delivering quality services and helping IT organizations build track records of operational excellence. Download it today.